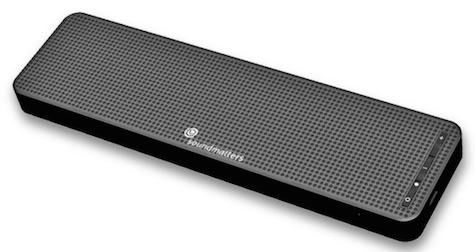 This premium thin, versatile micro-soundbar goes everywhere and does everything. Bluetooth wireless connectivity with Apple and other devices is quick and secure. Music sounds good within DASH A’s midrange-focused sonic spectrum. Hands-free phone, Skype, and FaceTime conversations in close range of the speaker are among the best we’ve tested. Included written instructions are concise and complete. Treble is acceptable and bass is minimal. The latter can be improved by placing DASH A on a resonant surface, such as a desk or table. I am listening now to piano solo jazz at my dining room table, and the bass sensation is conveyed from DASH A through the wood, both physically and aurally. Note: there is a tiny amount of white noise evident with both Bluetooth and audio cable connections. Unimpeded line of sight Bluetooth signals are clear up to the advertised 30 foot distance, and up to 45 feet with occasional sound gaps. Be aware this product is intended for personal, near-field usage. Soundmatters and other competitors have larger speakers in this price range and lower that are much louder, and with additional sonic presence. No other speaker we’ve seen matches DASH A’s combination of size (tiny), design (classy), construction (robust), speakerphone (very good), battery life (impressive), LED clarity (front facing), and tablet compatibility (extremely low profile). I wish other colors were available in addition to black, both for user choice and for ease in locating the little wonder in a cluttered tote. 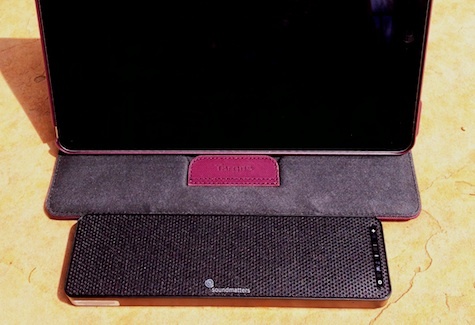 Ours is the only loudspeaker specifically designed to lay flat in front of the user’s tablet to get a more true and theater-like experience than any other on the market, with its unique low-profile design, and without blocking the view. If this feature and the others mentioned are important to you, and if the price is within your affordability range, you will be pleased with the foxL DASH A Portable Bluetooth Speaker with Microphone.